“How do you feel?” asks Marlize (Kim Engelbrecht) to her husband. “Enlightened,” responds Clifford DeVoe (Neil Sandilands) after being struck by lightning and hit by Dark Matter when the particle accelerator exploded four years ago in season four episode seven of The CW’s The Flash. 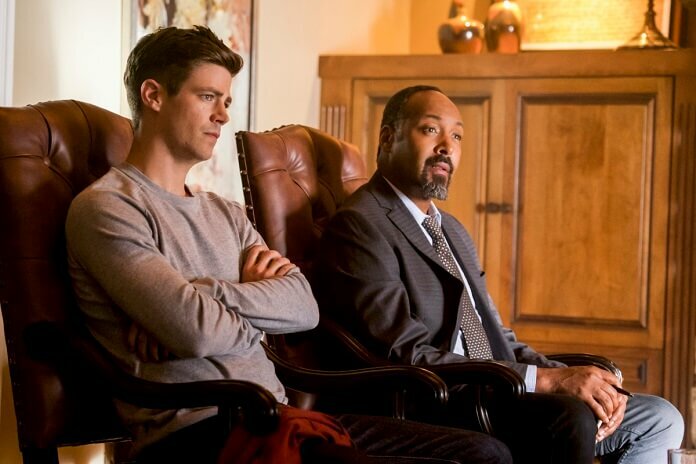 Flash forward to present day and Barry (Grant Gustin) and Joe (Jesse L. Martin) are questioning DeVoe in his home. Marlize sits next to him as they ask if he knows or recognizes any of the four photos of the meta-humans who were on the bus the day Barry came out of the Speed Force. The DeVoes play their façade nicely, coming off as a professor who’s passionate about knowledge and his devoted, homemaking wife. However, Barry senses it’s an act. Not seeing any reason to continue it further, Joe thanks the couple for their time and tells Barry they should go. Back at S.T.A.R. Labs, Team Flash is wondering if maybe they’ve focused on the wrong DeVoe. Barry’s insistent that he’s the master villain behind everything and that what they’re seeing is just an act. In a flashback to four years ago, Marlize shows Clifford she built his thinking cap but to get it to work and make his brain truly brilliant it would take an enormous amount of power. She admits she doesn’t know how they could ever create that much energy. DeVoe sees Dr. Wells on television telling the press that in the next few days he’ll be turning on his particle accelerator. Flash forward to present day and Barry sits in on one of DeVoe’s college lectures. After DeVoe dismisses the class, Barry approaches to ask a few follow-up questions. DeVoe gets agitated. Barry asks him where he was four years ago on January 7th (the day the particle accelerator exploded) and DeVoe says he doesn’t remember. Barry asks if he ever uses the bus and DeVoe says he prefers a more wheelchair-friendly mode of transportation. DeVoe tells Barry he feels as though he’s being persecuted, and Barry says he’s just trying to build a timeline. He leaves his card right after speeding behind him and stealing his coffee cup. Back at S.T.A.R. Labs, Caitlin (Danielle Panabaker) gets DeVoe’s DNA off the cup and tests it but it comes back negative for any meta-human genes. Team Flash tries telling Barry to ease up and that just makes him more agitated. Barry says DeVoe is the villain they’re looking for he; he’s certain of it. Iris (Candice Patton) pulls Barry aside and tells him that for now he needs to stop focusing on DeVoe because they don’t have anything solid to go after him for. She wants him to help her with their wedding. Another flashback to four years ago shows Wells (Tom Cavanagh) giving his last press conference before turning on the particle accelerator. Marlize asks him a few questions about how sure he is of the success of turning it on and what the chances are it won’t explode. Wells answers her questions and then asks her name. She answers Marlize DeVoe and Wells asks if the man standing next to her is her husband. Clifford answers yes. Wells tells him he’s a fan of his work and that the particle accelerator should have a big impact on both their futures. Marlize tells Clifford that Wells is lying and that she thinks he wants the particle accelerator to explode. She tries to talk Clifford out of using the event to power up his thinking cap, but he’s adamant he’s going to do it. A little later, DeVoe’s standing by the protesters in the rain when the particle accelerator explodes. DeVoe, wearing his cap, gets hit by lightning and dark matter knocking him off his feet. He passes out. Marlize runs to him yelling for him not to leave her, fearing he’s dead. She kisses him and DeVoe wakes up, gasping for breath. Returning to present day, Barry gets called into Singh’s office. DeVoe and Marlize have filed a complaint, telling the Captain they feel as though Barry has it out for them. Singh apologizes and tells Barry to apologize, which he does, and they leave his office. As Singh scolds Barry and then Joe for upsetting the professor, Barry watches DeVoe leave and notices what looks like a smirk on his face. Iris visits Barry at his office and warns him he needs to stop obsessing about DeVoe. He’s only going to get himself into more trouble with Singh and she wants him to focus on their wedding. Flashback to DeVoe at home demonstrating how brilliant his mind is as knowledge just pours into his brain. Being the smartest man in the world, Clifford believes he can now achieve his goals in the world. But, he begins to have a seizure and passes out. Present day and a frustrated Barry is alone in the control room of S.T.A.R. Labs when he hears a mechanical buzzing. He moves to where he hears it coming from and finds the camera inside the Samuroid’s helmet. (Why they would ever keep that is beyond comprehension.) Barry speeds to DeVoe’s house and waits for Marlize to leave. When she does, he phases into the house and starts snooping around. Only a few minutes later, Marlize returns and Barry’s forced into a hiding spot. Flashback to DeVoe and Marlize sitting in a doctor’s office. He’s been diagnosed with what seems to be extremely fast-moving ALS. The doctor’s perplexed why it’s so fast and Marlize asks for the doctor to excuse them for a minute. Once alone, Clifford tells Marlize his extra strong brain is sucking the life form his body like a parasite killing its host. It’s not long before he can’t even reach to pick up a book at home. Becoming despondent, DeVoe asks Marlize to let him die. However, she tells him she has no life without him and shows him something she’s working on that should help him. Once more to present day we go and Barry’s telling Team Flash about finding the hidden camera and going into DeVoe’s house to look for evidence of him being the master villain. Everyone’s upset with Barry basically breaking and entering the house, but Barry only gets more frustrated with his team’s unwillingness to believe him. Barry gets called to show up at Singh’s office. At the CCPD, Barry walks in to find Marlize, crying. She says she doesn’t feel safe and Barry starts to say he didn’t do anything when Singh shows him a photo of Barry in DeVoe’s house. Singh once again apologizes to Mrs. DeVoe and promises her he’ll get Barry to stop right now. As she leaves, she slaps Barry across the face telling him to leave them alone. Singh tells Barry to take two weeks off and start thinking about his future in law enforcement. At their apartment, Barry finally tells Iris that DeVoe feels more dangerous than Savitar, Zoom, and Thawne all put together. He confesses that ever since he came out of the Speed Force, he’s been happy. “My friends are safe, Joe’s about to be a father again, and I’m going to marry the love of my life,” says Barry. He’s afraid he has more to lose now than ever before. Iris tells him he needs to live in the moment. They will always have people coming after them, but they still need to try to enjoy life and be happy. Barry goes to see DeVoe again at college, willing to end up in jail. Barry asks him who he really is and DeVoe answers, “Well, who is asking me – Barry Allen or The Flash.” DeVoe admits he was created on the same night Barry was hit by lightning and Central City was covered in gene-altering dark matter. Barry asks why their tests didn’t show him being affected and DeVoe replies, “For such a fast man, you’re rather slow. I’m smarter than you.” Barry asks why he’s revealing himself now and DeVoe says, “Because I have nothing to fear from you.” “Yeah, well, I’d think twice about that,” replies Barry, reminding him that he has a team of some of the smartest minds across the multiverse. Back at S.T.A.R. Labs, Barry admits to Team Flash that he confronted DeVoe. Joe tells him he could get arrested but Barry tells him that DeVoe wanted him to do it and that he knows he’s The Flash. This causes Team Flash to stop doubting Barry and to FINALLY believe that DeVoe is the master criminal they’ve been looking for. Team Flash starts to apologize and Barry tells them to stop, that DeVoe has been playing all of them. He tells them DeVoe’s powers are his intellect. Cisco (Carlos Valdes) nicknames DeVoe “The Thinker” and Caitlin and Harry approve. Wally (Keiynan Lonsdale) returns and offers to help in the fight. He’s greeted with hugs by the happy team. In the final scene, Marlize comments to DeVoe on how Barry came to him as he knew he would. “He drew his strength from those he calls friends,” says DeVoe. “Sounds like you admire him,” replies Marlize. Intriguing and dramatic, season four episode seven titled “Therefore I Am” reveals how Clifford DeVoe went from an intelligent college professor who adores his wife to the brilliant and lethal master villain whose deadly plan is still unknown to Team Flash. 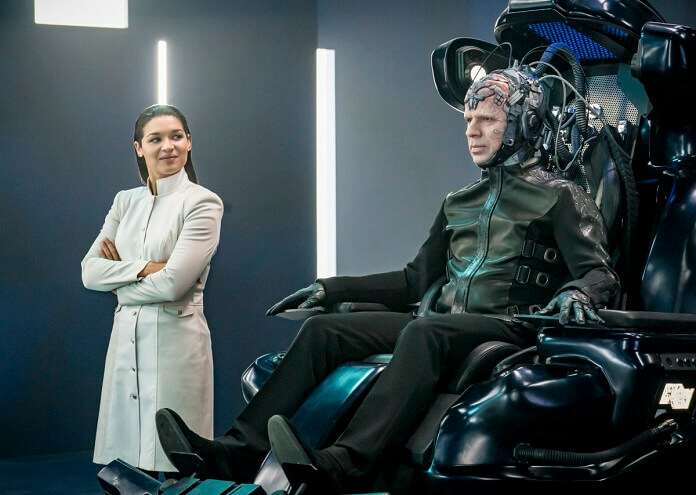 Filmed in less of the style of a The Flash episode and more like an Arrow episode with the constant flashbacks, it’s shown that DeVoe was originally trying to do something good with his thinking cap; he wanted to increase his knowledge to pass it on to the world. Only when he faces his own mortality and Marlize refuses to lose him to his accelerated ALS, do the two smart professors become dangerous villains. The standout performances this time go to Neil Sandilands as DeVoe and Kim Engelbrecht as Marlize. The two actors have great chemistry together showing how devoted and crazy about each other they were when they were just a married couple. Sandilands steals every scene he’s in, especially the showdown scene where he finally reveals himself as the master criminal Barry has been looking for. Another fantastic scene involves Cavanagh as Dr. Wells (aka Eobard Thawne) talks to DeVoe before the particle accelerator goes online. It’s Cavanagh’s performance hinting that Wells is a fan of DeVoe, not for his work as a college professor but his future work as a nemesis of The Flash, that brings back the wonderful evil feel of fake Wells that made the Reverse Flash the BEST villain of the series to date. With Barry and Iris about to get married, here’s looking forward to the big crossover episodes where the superheroes and their friends take on Nazis from Earth X.